Print full post recipe only without with images without with comments without with Testers Choice. Print me! 1. Bring a little water to a boil in a small saucepan and toss in the raisins. Turn off the heat and let steep for 2 minutes, then drain the raisins and pat them dry. 2. Put the yeast and milk in the bowl of a stand mixer and, using a wooden spoon, stir until the yeast is dissolved. Add the flour and salt and stir just to moisten the flour—don’t be concerned, the mixture will be shaggy and there may be dry patches. 3. In a small bowl, beat the eggs and yolk together lightly with a fork. Fit the mixer with the dough hook, if you have one, and, working on low speed, pour in the beaten eggs, mixing until they are incorporated. Add the sugar, increase the mixer speed to medium-high, and beat until the dough comes together and smoothes out a little, about 5 minutes. Reduce the mixer speed to medium and add the butter in 4 to 6 additions, squeezing each piece to soften it before adding it and beating until each one is almost fully incorporated before adding the next. 6. Generously butter a 9-inch kugelhopf mold (8-to-9-cup capacity) and put the chilled dough in the pan. Cover the pan lightly with buttered parchment or wax paper and let the dough rise in a warm place until it comes almost to the top of the mold, 2 to 3 hours. 7. When the dough has almost fully risen, center a rack in the oven and preheat the oven to 375°F (190°C). 8. Remove the paper and bake the kugelhopf for 10 minutes. Cover the pan loosely with a foil tent and bake for another 15 to 20 minutes, or until the kugelhopf is golden brown and has risen to the top — or, more likely, over the top — of the pan. Meanwhile, line a baking sheet with foil and place a rack over it. Remove the kugelhopf from the oven and unmold it on the rack. 9. Melt the butter and gently brush the hot cake with it, allowing the butter to soak into the cake. Sprinkle the hot cake lightly with sugar and cool it to room temperature. 10. Right before serving, dust the kugelhopf with confectioners’ sugar. 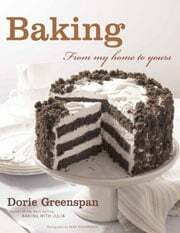 If you are not going to serve the cake as soon as it cools, because it stales quickly, wrap it in plastic without sprinkling it with confectioners’ sugar. Then sprinkle it with the sugar before serving. Luckily, stale kugelhopf is delicious cut into thick slices, toasted, and spread with butter and marmalade. Kugelhopf Recipe © 2006 Dorie Greenspan. Photo © 2006 Alan Richardson. All rights reserved. All recipes and photos used with permission of the publisher.